Too much Zucchini? Share the bounty! August 8th is National Sneak Some Zucchini Into Your Neighbor’s Porch Day! Ah Zucchini! Easy to grow and quick to take over the garden of an unsuspecting gardener (especially the novice), the ubiquitous zucchini is a summer squash that can be served up in so many ways – sautéed, roasted, boiled, fried, added to bread recipes, muffins and other baked goods. A search on Google quickly turns up nearly as many recipes as a single plant does zucchini. Seriously, access to fresh fruits and vegetables is often difficult for those with limited means, including the individuals and families who come to Tri-Lakes Cares. 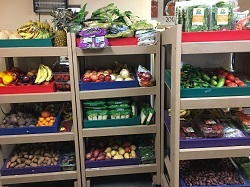 Through our “Help Yourself Market” and the generous donations of our food rescue partners, we are able to offer a wide variety of produce – both familiar and sometimes odd – that many of us take for granted. If you are a gardener, you can help by donating any extra tomatoes, lettuce, herbs, green beans, and yes, even zucchini! And, you don’t even have to sneak it onto our porch – ring our doorbell and we will gladly take it in. Do you have a favorite zucchini recipe? Share it in the comments section and we will re-share with our clients, volunteers and staff.